Cypress Bend 813 is your North Myrtle Beach escape! Located on the 6th hole at the Greg Norman signature course inside Barefoot Resort, this 2 bedroom/2 bath condo has everything you need for a relaxing getaway. Whether you want a place to call home while you explore the Myrtle Beach area or a quiet hideaway for unwinding and recharging, this condo delivers! Featuring great amenities like a full kitchen, balcony with patio furniture, WiFi, cable, washer/dryer, and outdoor pool, Cypress Bend has what you need for a fulfilling vacation. Barefoot Landing is close by, offering live entertainment, a variety of restaurants, Alligator Adventure wildlife park, and the House of Blues. Myrtle Beach attractions are just minutes away, and dozens of golf courses are within easy reach. 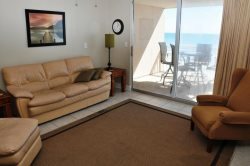 Call Ocean Drive Beach Rentals to reserve your spot in this premier Barefoot condo! Guests of Ocean Drive Beach Rentals have full access to on-site amenities and free parking for 2 vehicles.